With the recent divestments by the superannuation funds HESTA and NGS Super, Transfield Services has been under scrutiny from the Australian Council of Superannuation Investors (ACSI). 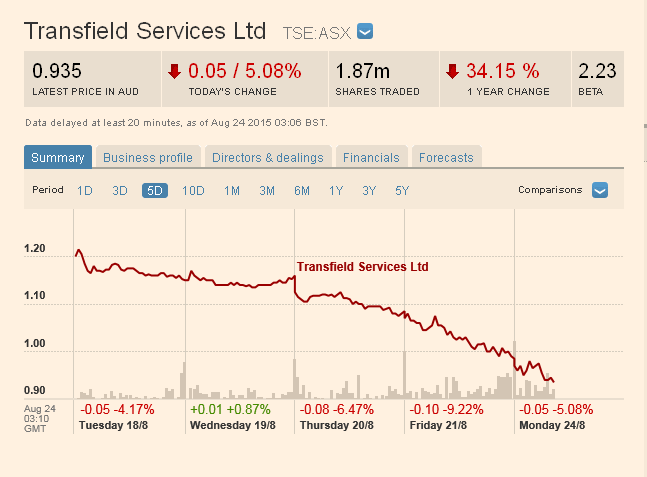 There are also questions as to whether Transfield Services has fulfilled its governance requirements in accurately reporting matters that may impact its shareprice to current and potential investors so that they may make an informed decision. In an effort to stem further divestments, Transfield Services, there are reports in Allan Gray’s own media outlets of giving the Australian Council of Superannuation Investors (ACSI) a tour of the detention camps on Manus and Nauru. Graeme Hunt owns over 4 million shares in Transfield, and in addition was paid around $3,629,982 as at June 2015. ACSI represents a membership of 39 superannuation funds who collectively invest over $A350bn in retirement savings on behalf of over 8 million super fund members. It is a signatory to the United Nations’ Principles for Responsible Investment. The PRI is premised on an acknowledgement of what it terms the “financial materiality of ESG issues.” That is, the PRI emphasises the financial impact of environmental, social and governance issues. ESG protocols include a mechanism for screening against investments in an industry or sector whose activity is harmful, as with tobacco. Every credible report on Australia’s mandatory detention system–from the Human Rights Commission to those undertaken by doctors and psychiatrists–has concluded that detention damages people. There are no excuses for continuing to invest in mandatory detention. As we have pointed out for some time, the deleterious nature of the detention industry will be reflected in its shareprice. The question is not whether ACSI should advise its members to divest from Transfield, but why they have not done so sooner. We call upon ACSI to act with due diligence, consider the facts, and not be swayed into managing the risks on behalf of a destructive industry. Superannuation funds invested in Transfield Services have declined in value — this means that continuing investments are in fact based on ideological adherence to the racist policy of mandatory detention and not fiduciary duty or ESG principles. ← How Managed Is The Conversation On #UniSuper?